Know your way around the Motor Circuit and beyond to help you make the most of your day. 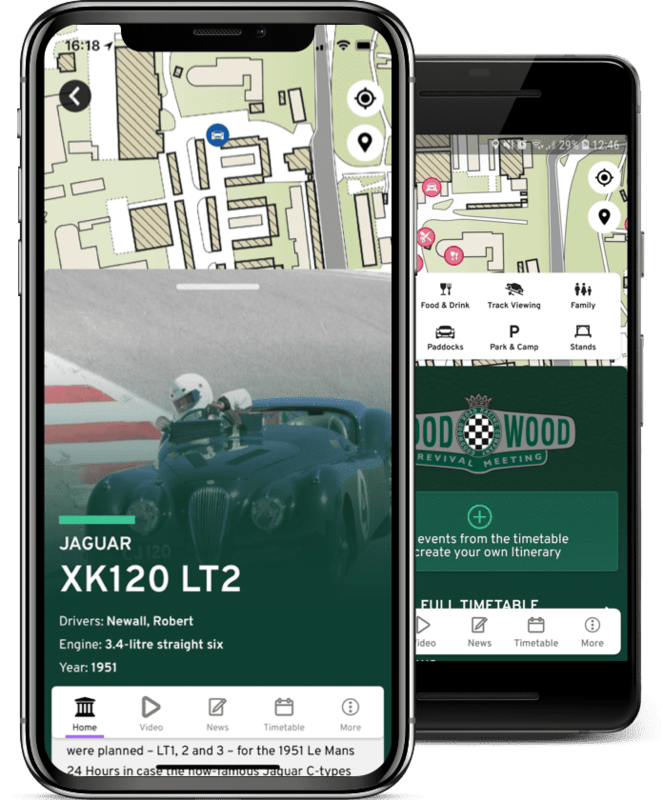 And don't forget to check the Programme and Explore the Event pages, as we will share all the latest news about cars, drivers and other activities over the weekend. While there is standing space all around the track, racing fans will prefer a Grandstand pass for covered and raised viewing of all the action on track. Choose from a Roving Grandstand to access multiple Grandstands around the circuit or from one of our specific Grandstands where you can pick your seat for the day. The Goodwood Revival is world famous for its thrilling wheel-to-wheel racing and the magical step back in time. However, did you know that at all our headline motorsport events, children 12 years old and under can enjoy the festivities for free and those aged between 13-21 are half price? There is so much to explore. Take a look at the event map to familiarise yourself with the area before you arrive. We are committed to ensuring all our visitors are able to enjoy their Revival experience. We have gathered some key information around accessibility. There are several parking options, whether you are turning up in a priceless classic car or a more modest ride. Whether you are travelling by car, bus, taxi, plane or train, we've highlighted the best routes for your convenience. A selection of delicious catering options around the Motor Circuit and Over the Road will suit all tastes. Take the hassle out of your return home by staying near the Motor Circuit, or at the event with our camping and glamping choices. Don't like camping? Visit our Goodwood Travel portal to explore local availability accommodation. Find out how you and the family can prepare for the Revival if you are bringing children along for the ride. The fabulous style of the 1940s - 60s is not one that we can often emulate, but the Revival is a place where this era of fashion is not just the norm - it is celebrated and cherished. Make sure you have your outfit ready! Shop until you drop at the Goodwood Revival and browse the list of exhibitors and shops below. Find out all the answers to your questions in our useful list of Revival FAQs. Browse our range of exceptional Hospitality packages, including our newest enclosures for 2019.